Today we’d like to introduce you to William Champion. The Store, The Museum, The Tourist Attraction. Champ’s Clock Shop has been family owned and operated in its original location since 1967. Their “Out in the Country” location and low overhead allow them to provide a larger selection of high quality clocks at a much better price to the consumer. The company was started as a hobby by William Jerry (Champ) Champion while he was employed by the City of Atlanta as a fire fighter and through word of mouth grew to the World’s Largest & Finest Selection of clocks. The company name originally was a nick name (Champ) given to Mr. Champion by his fellow firemen and jokingly the locker he was working out of was referred to as “Champ’s Clock Shop”. That was a long time ago. Jeff Champion, Champ’s son began helping in the business with show setups, deliveries and was chief tool hander since 1976. Jeff became a full-time employee in January of 1984 and is currently General Manager, Service Technician, Sales, Buyer, Etc. Nick Champion, Jeff’s son began full time employment July 29th 2014 to carry on as our third generation in the clock business. Nick currently does in home clock service, delivery, local moves, case repairs, etc. Pat Scheid, Jeff’s Aunt-in-Law is their Do All, Anything – sales, service, rhythm clock repair S\specialist, over the phone assistant and they are proud to say she has been with us since April 3rd 1996. Andrew Miles, Jeff’s Brother-in-Law came on as a clock repair apprentice June 13th 2011 and has become quite accomplished repairing all kinds of clocks. Just about any time you visit you will be greeted by Sharon, wife of Jerry Champion. She loves to give the shop tour, sharing its history and demonstrating their many unique clocks and artifacts of time. Deliveries in Metro Atlanta area are made only by a clock professional. A complete orientation is given describing all features and operations of the clock. All delivered Grandfather Clocks are covered by Champ’s three year in home warranty. All others have factory warranty. In addition to above, Champ’s provides many services related to clocks and their home owners. In the event of fire, flood or storm damage, they pick up and store clocks while repair are made and make repairs if necessary to the clock before return. They pack and ship including local and out of state moves direct. In home service calls are an ongoing part of their business as well. From the mid 1970’s our business grew steadily in sales of all kinds of clocks. As the building expanded with new editions to hold our sales collections, our sales of Grandfather, Wall, Mantel, Cuckoo, Nautical, Animated, Novelty and one of a Kind Heirlooms exceeded thousands of clocks per year. Clock sales worldwide started to decline in the last 20 years. Rarely do you see fine clocks on display anywhere. Our business has become more specialized now than any time in our 50-year history. We continue to house the world’s largest and finest selection of clocks and keep many fresh new designs on hand, but many items you will see are the last of their kind. Where the past yielded hundreds of clock makers, today there are only a hand full of makers worldwide. The largest of them have survived the decline and continue to make beautiful heirlooms for our future generations. We have those clocks for you and more. Please tell us about Champ’s Clock Shop. Champ’s Clock Shop houses the world’s largest and finest selection of clocks for sale. We have on display the world’s largest real German Cuckoo Clock, the last all American made grandfather clock by Herschede. Our cuckoo wall, while not as full as the shops in Bavaria, rivals most selection you will see anywhere else. 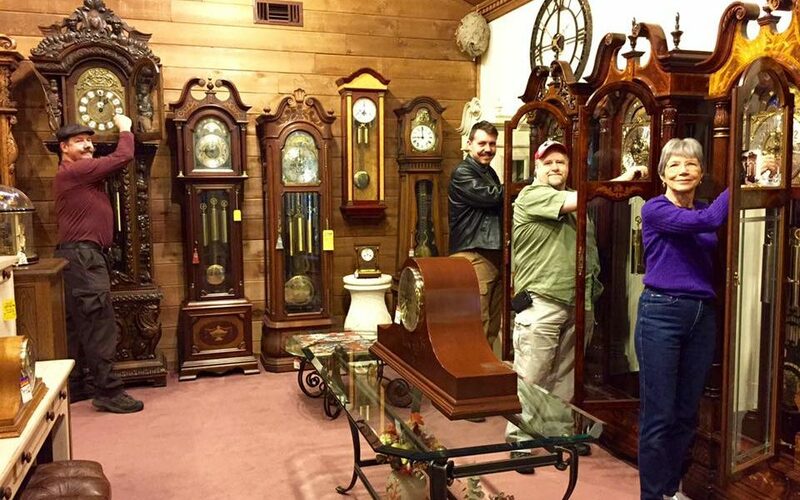 Our selection of Grandfather Clocks with a variety of tubular and rod chime models has no rival. The shop is an ever-changing museum of time. Take a trip to our clock tower and witness time keeping from our circa 1865 English made, original John Moore and Sons tower clock. Today it continues to operate as it did over 150 years ago in its London suburb, Winchmore Hill Eversley Estate Mansion of the late Henry Wigan D.1881. There are many one of a kind and specialty clocks that you likely would see in a museum. No reason to try to change the past for the present. Our business Is the same as it has been, providing clock services and an ultimate selection, there is a continuing support for quality but you simply not going to see growth. Our business is necessary and it is a genuine link to nostalgia like few others. It’s a love a passion for clocks, we have to keep it alive for future generations to enjoy. In a way, it’s like keeping the origins of music era’s alive. Classical is our basis of modern music, but the big band era will possibly die with its WW2 listeners if it is not preserved and kept in reserve. Clocks are in a similar danger of becoming extinct, At least in the way previous generations have enjoyed them. In the high-tech era of iPhone, digital phone service and worldwide internet, nostalgia still has a place in society. Part of why you see vinyl albums making a comeback.